Can you believe that we only have two and a half months until the end of the year?! Time has certainly shot past this year again. It is around this time that we often start thinking of our goals for the new year. Perhaps you are planning a wedding for the new year? Have you worked out a timetable of your goals? Well, I also have some goals for my little business. As you may know, I have taken it easy the last couple of years (spent some great time with my kids!). Taking a blogging e-course with Decor8 (see this post) has already started the ball rolling in terms of working towards my goals. I would like a website that is fresh, that showcases my work and that I can edit. I think that applying my blog to my web address would give me the flexibility I want. While I think this e-course will help me achieve my goal, I can see that it is going to provide a whole lot of additional inspiration and encouragement which is a wonderful bonus! 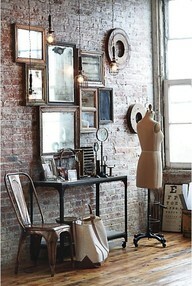 I would also like to give my little studio a revamp. I have been collecting various images of inspiration on my pinterest boards. I have already made some bunting to pretty up the garden near the entrance. A lick of paint always goes along way. I'd like to add a pinboard to display some of the Thank You cards I've received from 'my' brides. And some additional lighting (fairy lights with tulle) will add some sparkle. The most important part of the project, though, is probably a good old clear-out. I've started with this ... and it's giving me a great opportunity to take stock of the fabric that I have (yay!). While I adore the picture to the left, my studio is considerably smaller and lends itself to a fresh, white make-over. I'll keep you posted as I reach my goals. Please share some of your goals with me! Just saying hello from BYW - looking forward to seeing your studio space when its completed - how great is Pinterest for inspiration?? Yay, my very first comment! Thank you! And, yes, I find Pinterest quite addictive.